This is a ruckus selection of audio from the HomeBrewed Christianity live event at the Subverting the Norm 2 conference last weekend. It begins with Barry Taylor and the Band then moves on to 4 toasts offered in honor of the 4 faces on our Mt. 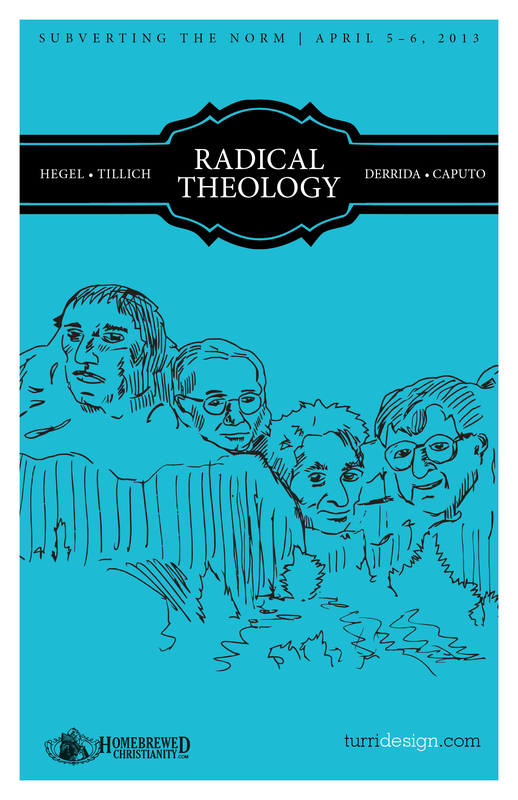 Rushmore style Radical Theology poster for the event. Hegel, Tillich, Derrida and Caputo are toasted by Kirsten Gerdes, Tripp Fuller, Jack Caputo and Peter Rollins. Tony Jones sat in for Bo Sanders in ‘the Practical Seat’ and you will be able to hear how wild things got as the evening progressed. There was also a contest between Tripp’s two new brews: the Caputo Decon-structor Ale and the John Cobb #Faniac Ale. If Radical Theology is something that interests you, make sure to sign up for the Summer Reading-Video Conference with Tripp and Pete called “High Gravity”. Leave us some feedback about this episode by using the little microphone on the front page in the ‘Speak Pipe’.